With two WSL 1 games remaining, Katie Chapman's Chelsea are two points clear at the top of the table. 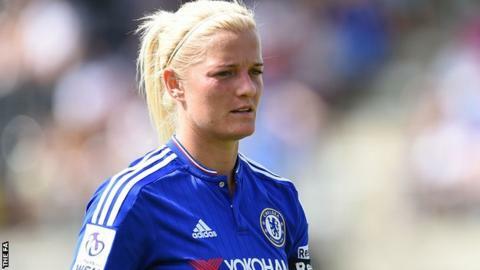 Chelsea Ladies captain Katie Chapman has signed a new two-year contract with the Women's Super League One leaders. The 33-year-old led the club to FA Cup glory in August, the first piece of silverware in their history. She has won the trophy nine times with five different clubs. Midfielder Chapman, a member of England's Women's World Cup bronze medal-winning side in Canada, has made 37 appearances for Chelsea since joining from Arsenal in January 2014. Mother of three Chapman, who had her England central contract cancelled in 2010 when she asked for time off to be with her family, was recalled by Lionesses boss Mark Sampson for the World Cup in Canada. She started five games for England, included the 1-0 win over Germany in the third/fourth-place play-off game.